Pull behind motorcycle trailers are lightweight, easy to pull trailers, which should be designed to carry all the things that you need to provide comfortable trip. The floor of this trailer should be flat and large enough so you can place all the things you may need while on the road. Today most bikers like when traveling with their favorite motorcycles, to enjoy all the comforts they have at home. That's why they often are looking for pull behind motorcycle trailers in order to store their extra gear and luggage. Most of the pull behind motorcycle trailers are made out of aluminum or fiberglass. Trailers made of aluminum are mainly standard in shape-they are boxy, while trailers made of fiberglass allows more creativity still being very durable. When buying a pull behind motorcycle trailer one must consider some things. First, make sure that the trailer is not wider than the bike in order not to have trouble passing with the trailer attached. Next, take care about the height of the trailer. It shouldn't be higher than the top of your tour pack. There is a huge range of different models of pull behind motorcycle trailers such as: Bushtec, Aluma, Hannigan and so on. - Bushtec trailers are designed to fit the big cruisers. It is very handsome trailer which is quality engineered. 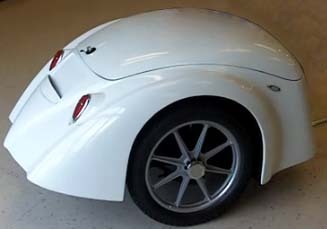 It is small, with teardrop shape with exposed fenders. This trailer so perfectly matches to the motorcycle thanks to its design and performance, that it becomes a part of the bike. 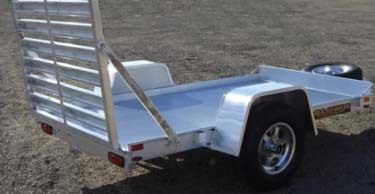 - Aluma trailers are lightweight, strong, and rust-free thus offering years of use without having any troubles. They are reliable and easy to clean due to their aluminum construction. They feature aluminum fenders, lockable lid with over-lapping lip for waterproof protection, luggage rack on lid. As they are lightweight, they are fuel efficient and thanks to the material they are made of they are very easy to clean. - Hannigan trailers are so lightweight that one can hardly notice that they are behind the motorcycle. They are aerodynamic and give the carrying capacity of 24-27 cubic feet. Standard features include independent suspension with twin trailing arms, 2 inch powder coated frame with shock towers and coil gas shocks, 12 inch chrome wheels, carpeted floor, interior light, side running lights, and frenched-in tail and brake lights. Motorcycle riding around the countryside has long been a choice for many enthusiasts. When you have pull behind campers for motorcycles, you can enjoy both worlds, the thrill of the road and the adventures of camping.Travel to Texas or up to Utah, but take the motorcycle and the camper along for great times. The campers for pop up camping are small enough for any size or year of motorcycle. Many people have a pull behind camper that opens up into a nice sized camper that sleeps four people, but two people are idea. If you have a sidecar for the traveling child, you will have more than enough room for sleeping and if the weather is bad, you can always set up the screen tent. It just goes to show you, anyone can enjoy camping no matter if they have car, van or motorcycle. Even a Harley Davidson motorcycle, whether a 1986 or a 1987 or newer can pull a pop up camper behind. Spacious inside would be one way to describe these little pop up campers. If you need to haul along supplies and personal belonging, they fit nicely inside the camper when closed. The nice thing is everyone no matter what they choose to drive can enjoy camping. If you decide on pull behind campers for motorcycles and need a good place to start looking, Harley Davidson dealers as well as other camper dealers have some real nice campers for the back of motorcycles. The weight is hardly noticeable on the open road and with a little practice around the block a few times, you will have it down pat. After that, you will be ready to travel anywhere you want without spending a fortune on hotels or sleeping under the stars with all the other little creatures running around. In 1989 or 1988, I had a talk with a person who traveled around the countryside with his motorcycle and a tent. He went everywhere and camped out with a pop up tent. I last saw him in Virginia and have not seen him since, but he was talking about the pull behind motorcycle trailer. He had heard that they were difficult to pull behind a bike, but he really wanted one. I sit and think about him every time I see a motorcycle with a camper towing behind. He was a younger person who loves biking around and just wanted to enjoy life. I often wonder if he ever bought or built his own camper as we had talked about. I recently spent some time in Vermont where the motorcycle group, Hog Riders, or something like that had a reunion. They were a bunch people like lawyers, accountants and various other people in other professions. They were a fun group to converse with anytime. They had different size campers and most had along their better half. They camped and traveled to the area on motorcycles with the pop up camper to have their reunion. I found out they do this once a year and pick a different state every year to stop at and camp for the week. Some of them had a slightly better set up, but I guess it depends on your personal needs. One rider had just bought a new pull behind motorcycle trailer and everyone was just amazed at the small size that opened up into a nice size camper with an attached screen tent and many accessories. I must say, I was tempted to buy a bike and camper myself. The wife of course, put a stop to my way thinking quickly. She likes our camper and the Suburban we drive.